The latest reviewed version was checked on 15 April 2015. There is 1 pending change awaiting review. Sodium metal is soft enough to be cut with a knife. The alkali metals are the elements in Group 1 (1A). They are lithium, sodium, potassium, rubidium, cesium, and francium. These elements are best marked by their reactivity. 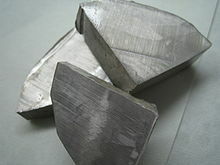 Physically they are soft, shiny (when freshly prepared) solids with low melting points; they conduct electricity well. They all have one valence electron that they lose easily to almost any electronegative substance. Alkali metals are never found in their elemental form outside the lab because they are too reactive. Even the smallest amount of oxygen or water would react with the metal. For this reason, alkali metals have no structural use. They must be kept under inert liquids such as kerosene or in inert gases (nitrogen suffices for any of these elements other than lithium). Alkali metals have many uses in both biological life and industry. Francium, however, is radioactive and decays rapidly to other elements, so it has no commercial use and its chemical properties are vaguely understood. All oxidize easily to the +1 oxidation state. The alkali metals have very similar chemical and physical properties. They can be studied as a whole, rather than element-by-element, due to this similarity. Leave experiments with alkali metals to the experienced chemists. Alkali metals are dangerous. Their reactions release enough heat to cause flames, and may produce explosive byproducts like hydrogen gas. Never cast any alkali metal into water or acids. These metals should never be allowed to touch flesh because they react with any water upon them and yield corrosive hydroxides that damage flesh. Alkali metals react with oxygen to form oxides, which have a duller appearance and lower reactivity. The oxides are much less reactive than the pure metals. However, the oxides do react vigorously with water to form a hydroxide. The resulting hydroxides of these elements disasociate completely in water to form some of the strongest bases known. "Lye" is an industrial-strength base, which is sodium hydroxide (NaOH). These hydroxides react readily with acids to form water and their corresponding alkali salt in a neutralization reaction. The pure alkali metal can also react directly with water. In this case, the metal is a basic anhydride. Gaseous hydrogen is released, which is flammable. Exposing an alkali metal to a halogen will cause an extremely exothermic reaction that results in an ionic salt. Almost every salt of an alkali metal is highly soluble in water. They form conducting solutions, proving their ionic nature. When burned in a flame, the alkali metals give off a unique color that can be used to identify them.